Ideal for heavy duty wiping tasks. Combined high strength and absorbency. Colour coded to help reduce cross contamination where health and safety are vital. The WypAll X80 Colour-Coded Range has been specially designed for tough maintenance and cleaning tasks in food processing and healthcare environments. Perfect for use in high hygiene areas, these cloths are food contact certified and available in 4 different colours to help avoid cross-contamination. Leading the way in hygiene, our goal is to support you in reducing the risk of cross-contamination and facilitate task segregation where it is a key requirement. 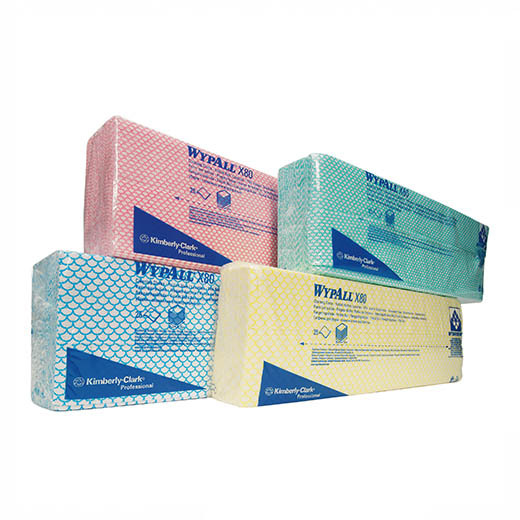 WypAll X80 Colour-Coded Cloths have been designed to enhance regulatory hygiene practices and compliance. Advanced Hydroknit technology ensures each cloth is strong, durable and highly absorbent without tearing.Delivered in a hygienic poly pack to provide protection from cross-contamination whilst also ensuring you only touch the sheet that you use. Each poly pack delivers single sheet dispensing, to control usage and reduce waste. Each pack contains 2 x 25 sheets for a total 50 cloths.